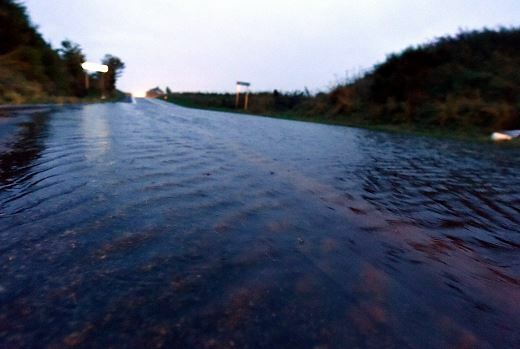 Flooding on the A90 closed the road overnight, 4 miles south of Fraserburgh. Motorists on the commute home last night faced traffic chaos after Traffic Scotland was forced to close the A90 between Fraserburgh and Peterhead in both directions due to flooding. The closure came into effect just before 6pm with the road due to re-open this morning. Weather warnings were put in place yesterday morning by the Met Office and the 12-hour yellow “be-aware” warning came into force at 6am. Across the region evening commuters fell foul to the wet conditions and six cars were reported to have gone off the roads and into fields and ditches, near Huntly, Oldmeldrum, Inverurie and Braemar. A spokesman for the Met Office last night forecast continued showers for parts of the north-east today, but a dry day tomorrow evening should bring the weekend to a pleasant close. Having basked in the sunshine on Thursday with the warmest recording in Scotland of 22.1 C, Fyvie Castle had reigned again yesterday with the highest rainfall recorded in the north-east – with just less than 1.5 inches of rain.